Everyone has had one of those nights. One of those nights when you lay awake wondering about your life. Wondering if you made the right decision, wondering if you’re on the right track, wondering if there’s something else you could do that would make you happier. We wonder if we’re getting the most out of life. To get the most out of life, we have to answer some deep questions. Questions about happiness and success, about meaning and significance. Questions about what’s real and what’s true. Questions about right and wrong, and how we choose to live. Questions about the problems in the world, and what we think about them. Questions about God. Is God real, and if He is, is it possible to know Him? And if we dare, we have to think about death and what happens when we die. These are the human questions, questions everyone wonders about. Only humans think about these questions. Cats and dogs don’t think about these things. And how we answer questions like these determines who we are at our core, what is truly important to us, and what kind of person we become. We may try to ignore the questions. We may pass the time surfing the web or watching a movie, but the questions remain. We may ambitiously pursue a career or just fill life with endless activity, but the questions still remain. They have to be answered. Because how we answer life’s big questions shapes who we are, what we believe, and how we live our lives. 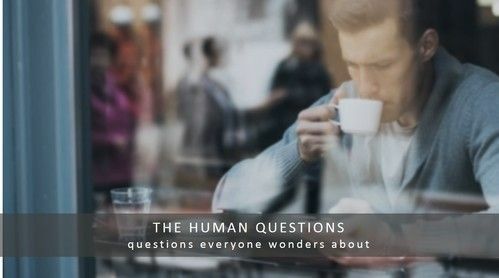 Whether you’re a Christian or not, spiritual or secular in your thinking, how you answer “the human questions” will determine the foundation of your life, and whether that foundation is solid and true.